This first-level wind band draws experienced music students, primarily freshmen who studied at Joaquin Moraga Intermediate, Stanley Middle or other middle schools, but also older students who will benefit from the experience. The advanced symphonic band includes winds, brass and percussion instrumentalists, primarily sophomores, juniors and seniors, although incoming freshmen may audition in the spring. This band plays high school and college level repertoire. 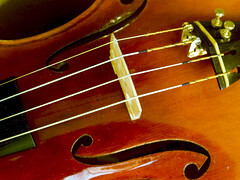 Campolindo’s string orchestra includes freshmen through seniors and performs high school and college level repertoire. Some repertoire, such as Beethoven’s symphonies, are performed with brass, wind and percussion musicians drawn from the symphonic band. Entrance to Jazz Band is by audition only. In addition to concerts and competitions, the jazz band also performs at the annual Jazz Dinner Dance. For this year’s Jazz Dinner Dance information, click the Concert Dates tab. This advanced placement course is open to any sophomore, junior or senior interested in music. It includes basic music theory and composing. Campolindo’s musicians perform at Campolindo’s Performing Arts Center (CPAC) for all concerts and in the orchestra pit for the spring musical. Depending on the individual skill level, an 8th grade band student may want to join the Symphonic and Jazz Band right away. In that case, contact Mr. Johnson for an audition. Auditions are held in the spring and by appointment only. THE CAMPOLINDO MUSIC BOOSTERS is the parent organization responsible for supporting Campo’s Instrumental Music program. Membership dues and donations are used to help enrich the instrumental music program. For more information, click the About Us tab. The Campolindo Orchestra has been accepted as a participant in the Chicago International Music Festival run by World Projects – one of four high schools and two universities accepted into the festival. More information here. The dates of the festival are March 24-28, 2016, just about a year away. Many steps must be taken between now and then but we are proceeding with our eyes on the prize! Our first benchmark will be a Letter of Intent and a deposit from each student. The likely due date will be June 1. Look for that to be distributed soon. 1. SHOULD MUSICIANS BRING THEIR INSTRUMENTS ON THE FIRST DAY OF SCHOOL? No. The first day is usually spent getting acquainted and finding out what Maestro Johnson expects of his troops. There is no jazz band on the first day of school. 2. IS THERE SOMEWHERE SAFE TO STASH INSTRUMENTS? Yes, the band room has musical instrument lockers, which students share. You will need a combination lock. 3. WHAT IS THE STUDENT MUSIC COUNCIL? Students are represented by an elected student music council, which helps organize social activities, the Welcome Back BBQ for new and returning students, Pep Band gigs, and other events, including this fall’s outing to the Lesher Center for a multimedia concert, and a movie night in the bandroom. Elections are held each spring, and the concert band elects its representative in the fall. To see a list of this year’s officers, click the “About Campo Music” tab at the top of the page. ** View the Performance Review Calendar Page here. Check out the new menu tab Community Events. These events can be used for Performance Reviews. For more than a decade, intense interest in how the arts stimulate learning has engaged researchers. Their efforts show that the study of music, drama, writing, dance and the visual arts helps excite and reinforce learning in subjects beyond the arts, like math, English and science. Yet, as budgets shrink, the arts have been withdrawn from many of our schools and classrooms. We need to change this. Arts education is not a frill; it is beneficial to every student. Art has the power to help students understand and shape the world. However, arts education in America’s schools, colleges and universities is facing an escalating crisis which, if not dealt with soon, will deepen in both intensity and gravity. It will continue to directly and adversely affect the quality of education available to our students and the well-being of our nation. To reverse this trend, the College Board established the National Task Force on the Arts in Education (NTFAE) to address the opportunities and challenges facing arts education in the United States. The College Board is committed to making the arts accessible to all students.